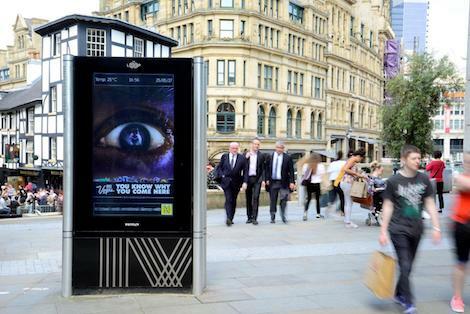 Signature Outdoor is doubling the presence of its small format full-motion city screen advertising network in Birmingham and Manchester to offer advertisers greater reach and impressions. The Loop was Birmingham’s first small format, full-motion city centre screen advertising network. In conjunction with its launch in 2015, Manchester’s existing small format full-motion city centre network was acquired and rebranded The Loop Manchester. Responding to high demand for quality small format digital advertising in both cities, work is underway to extend The Loop in key retail, business and leisure hot spots, increasing audience reach and impressions to 15.86 million a fortnight across the two cities. New locations have been identified to reflect Manchester and Birmingham’s redevelopment, reaching audiences as they move around the reconfigured cities. In Birmingham, 23 screens in 12 locations expand to 45 screens in 23 locations, delivering a total of 8.46 million impressions per fortnight. In Manchester, 20 screens in 10 locations are doubled to 40 screens in 20 locations, delivering 7.4 million impressions. Manchester’s new screens are in Deansgate and Albert Square, directly outside the Town Hall and National Football Museum. The new Birmingham assets cover key new areas such as Chinatown with Ladywell Walk, New Street Station approach with TK Maxx and Smallbrook Queensway, Corporation Street. The move extends availability to Signature’s fast and free SimplyFi wifi network, offering brands multiple connectivity and engagement with mobile users in the cities through The Loop. Channel expansion is carried out in collaboration with Signature’s commercial advertising partners, Birmingham City Council and Manchester City Council. Both extended networks go live in July. Advertisers including Clinique in Birmingham and Walkers in Manchester have utilised the technical capabilities of The Loop, with premium brands Chanel, Samsung, Apple and LVMH all leveraging out of home audiences. This entry was posted on Sunday, June 4th, 2017 at 16:50 @743 and is filed under DailyDOOH Update. You can follow any responses to this entry through the RSS 2.0 feed. You can leave a response, or trackback from your own site.